Sony has announced that the long awaited replacement of A700, the A77-SLT will arrive in mid-2011, along with a new kit lens, new flash, new battery grip, and more interesting, a 500mm f / 4 G-series lens. Although not officially announced, this is what Sony has to say about the A77 in their media for tradeshow C + photos. 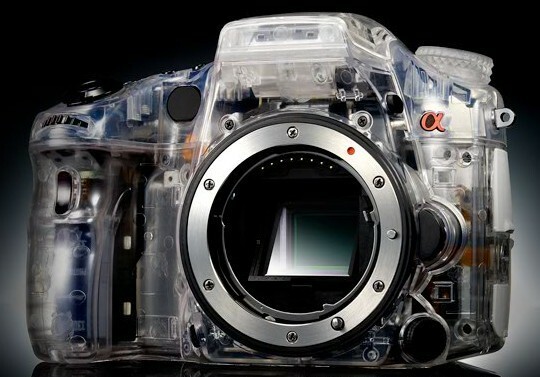 Adopted a semi-transparent mirror “Mirror translucent Technology” and the newly developed “Exmor” CMOS sensor is APS HD will be installed in series A mid-mounted engine concept model (skeleton model) on display.The intermediate unit, will be available later this year and 2011, He worked fast and accurate auto focus at all times, full HD video and still there is always a focus (AVCHD) provides picture.The standard zoom lens suitable for intermediate units, the flash will show along with the vertical grip. Press clips followed by a link showing off a prototype A77.